Giant Axe, the home of Lancaster City. Lancaster City leapfrogged Burscough into the final play-off place with their fifth straight Evo-Stik First Division North win on Tuesday night. 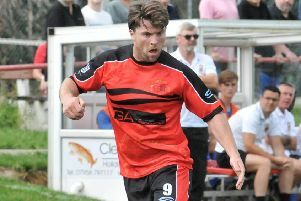 Craig Carney scored the only goal of the game on 75 minutes, heading home Billy Akrigg’s left-wing cross, as Phil Brown’s side continued to put themselves right into promotion contention. Both sides played some decent football in the early exchanges with Akrigg’s break into the box the only real opening, his pull back being blocked by the leg of Burscough ‘keeper Calvin Hare. Chances were few and far between, Ryan Winder and Tom Kilifin seeing shots blocked after the visitors failed to clear a cross on the quarter hour. Mike Hale was called into action for the first time half an hour in, needing a strong right hand to produce a fine save to keep out Michael Monaghan’s well-struck shot from 20 yards. The hosts then nearly profited from a rush of blood from Hare shortly after but after he raced from his goal and got nowhere near Akrigg’s high ball into the box Neil Marshall’s header only found the side netting. The Linnets were the first to go close after the break, Hale unable to hold onto Alex Honeyball’s free-kick as he helped it round the post. As the half developed however it was Lancaster who upped the pressure, Kilifin seeing a second shot of the night blocked after Gavin Clark’s long free-kick had dropped to him 10 minutes after the interval. Kilfin did finally get a free shot on goal on 67 minutes. The striker released Carney in on goal but after the midfielder was denied an effort on goal the ball broke for the advancing striker 15 yards out but Hare saved well to his left. The Blues didn’t have to wait much longer for their opening goal however as they went in front 15 minutes from time. Akrigg did well to retrieve the ball on the left-hand side of the area and whipped in a cross with Carney flicking home a fine header into the far corner. City nearly made it two on 85 minutes but Akrigg could only slice wide from 15 yards after a good driving run from Winder. It was a big chance but the miss mattered not as the Dolly Blues’ fine run went on. Lancaster City: Hale, Henry, Mercer, Marshall (capt), G Clark, Davis, Akrigg, Winder (Watson 90), Carney, Cummings (Shearwood 82), Kilifin (Z Clark 86). Subs not used: Rogerson, West. Burscough: Hare, Camozzi, Honeyball, Brown, Ryan, Williams (capt), Monaghan, Smart (Noon 79), Jones, Caddick (Lewis 70), Whittington (Jewell 60). Subs not used: Rice, Conway.